A clinical trial asks whether the FDA-approved heart medicine mexiletine might slow ALS by reducing hyperexcitability, a potential early step in the disease. Calming ALS nerves Mexiletine may help protect the motor nerves from further damage by reducing the overactivity of sodium channels (blue) snaking through the CNS. Courtesy of Wellcome Images. New medicines can take more than a decade to go from the laboratory to the clinic. But with many of their ALS patients facing 2-5 years to live, clinicians are rethinking the way that potential medicines are being pushed forward in the clinic. Adaptive clinical trial designs according to some experts might enable drugs to be evaluated more rapidly. And, futility studies may allow ineffective and unsafe medicines to be more quickly discarded. Some researchers, however, hope to bring potentially life-changing treatments to people with ALS even faster by dusting off existing FDA-approved drugs from pharmacy shelves which target emerging key mechanisms of the disease. One of these medicines, mexiletine, may help reduce the overactivity (hyperexcitability) of certain neurons in people with ALS, a potentially early step in the disease. The drug, suspect researchers, may therefore reduce further injury to the motor nerves – slowing the progression of the disease. The phase II clinical trial is scheduled to begin sometime in early 2013. Check out our podcast with UW neurologist Michael Weiss MD to learn more about mexiletine and its potential benefits for people with ALS. Clinicians first looked to mexiletine in the early 1990s to reduce muscle stiffness in people with a rare group of muscle diseases called myotonias. 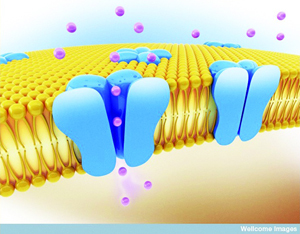 The drug, originally developed to regulate heart rhythms, is thought to shut the gate of inappropriately activated sodium channels - helping muscles relax more easily. Mexiletine, recently put to the test in people with non-dystrophic myotonias, appears to reduce key signs of “myotonia” including muscle stiffness and muscle pain. The drug is quickly becoming routine practice for myotonia in people with these muscle diseases. “We showed that mexiletine worked. It’s a really big deal,” says University of Kansas Medical Center neuromuscular disease specialist Richard Barohn MD, leader of the study. Mexiletine is now being evaluated as a potential treatment for muscle cramps in a growing number of conditions– including in people with ALS. University of Massachusetts neurologist Robert Brown MD however suspects that mexiletine might do much more for people with ALS. The drug might reduce the overactivity of sodium channels on certain neurons in the brain and spinal cord – a potential cause or contributor to the damage that fuels the progression of ALS. The daily treatment of mexiletine according to Brown significantly extends the survival of a mouse model of the disease. Quiet down Mexiletine might reduce the flow of sodium ions (green) through neuronal channels (above) in the brain and spinal cord - helping to protect the motor nerves. Video: Courtesy of Vladimir Yarov-Yarovoy PhD, University of California – Davis School of Medicine. This overactivity, know as hyperexcitability, is suspected to be an early step in the disease according to studies led by King's College London's Kerry Mills PhD FRCP and Neuroscience Research Australia’s Steve Vucic PhD. Sodium channels that decorate certain neurons of the motor regions of the brain appear to be overactive in people with ALS. And, these changes may occur before the onset of symptoms according to a small study of people at high risk of developing the familial form of the disease. Mexiletine therefore might not only protect the motor nerves from further damage; the drug might slow ALS even earlier in the disease course. Now, US neurologists are gearing up to put mexiletine to the test in people with ALS to determine whether the drug can indeed slow down the disease. The 16 week phase II clinical trial will take place at 10 Northeast ALS Consortium (NEALS) sites in the US including the University of Washington School of Medicine, University of Kansas Medical Center and Penn State University School of Medicine. The main goal is to evaluate the safety and tolerability of mexiletine in people with ALS. Other measures include functional abilities (ALS FRS) and the frequency and severity of muscle cramps. 60 people with ALS are expected to participate.